Florida Highway Patrol and Broward County Sheriff Fire/Rescue responded Friday morning to the southbound lanes of I-95 near Hallandale Beach Boulevard. A dump truck hit a car that was forced onto the shoulder and hit an FHP cruiser. 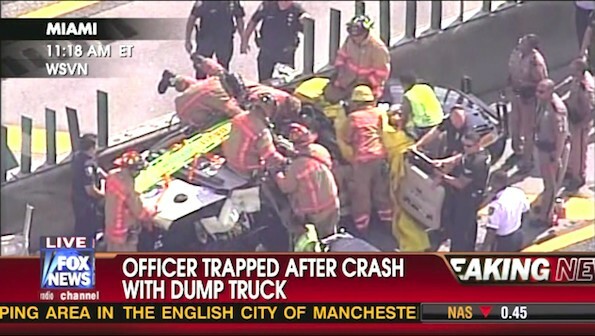 The dump truck driver fled the scene — driving away in the dump truck. Police are searching for a white 2000 Sterling dump truck with Florida license plate N8946R. Firefighter/paramedics removed the roof of the trooper’s cruiser during extrication, and transferred the trooper to a backboard, and to a rescue ambulance. 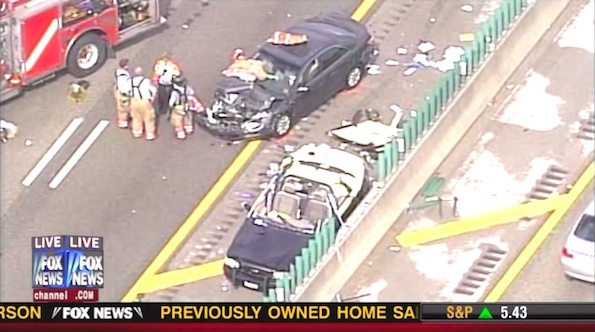 Southbound I-95 was close during extrication operations. The northbound lanes were temporarily closed while the rescue ambulance oriented itself toward Memorial Regional Hospital in Hollywood, Florida.